The possibility of an Asian regional crystallographic group was mooted almost ten years ago. With the formation of the European Crystallographic Committee for coordinating activities in Eastern and Western Europe, and the fact that the American Crystallographic Association had become the defacto regional organisation for Canada and other countries in the Americas, it was suggested that a similar organisation would be beneficial to the Asian region. Early informal discussions centered on defining the boundaries of the regional group. Overlap with the ECC or the ACA was considered undesirable, and the boundaries should be as simple as possible geographically. It was decided that the region would defined by a 'circle' passing through Japan, China, India, Pakistan, Australia and New Zealand. Other crystallographic communities enclosed in the region included Bangladesh, Hong Kong, Korea, Malaysia, Philippines, Singapore, Sri Lanka, Taiwan and Thailand. Representatives from most of these countries attended an informal meeting at the 1984 lUCr Congress in Hamburg to discuss the formation of a regional group. The meeting was chaired by the then President of the Society of Crystallographers in Australia, Terry Sabine. At this meeting it was resolved that the SCA should prepare and circulate a draft constitution for consideration at the 1987 Perth lUCr Congress. Rod Hill, who was Honorary Secretary of the SCA, was made responsible for coordinating the drafting, circulation and updating of the constitution. Prior to the Perth Congress three drafts of the constitution were circulated for comment and adjustment. 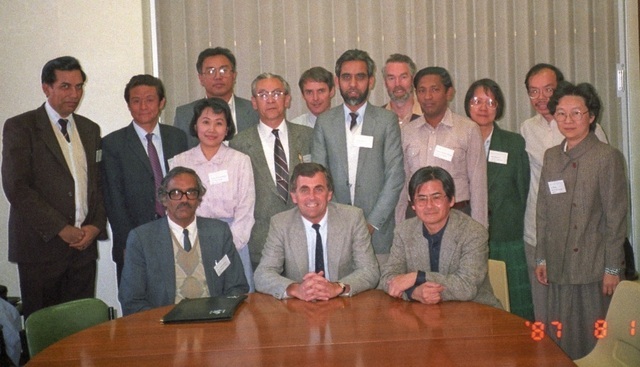 On Friday August 14 1987 a meeting of regional representatives approved the draft constitution, and the Asian Crystallographic Association came into being. ... The first meeting of the ASCA Council on Monday August 17 1987 elected the Executive members of the ASCA, composed of a President, a Vice President and a Secretary Treasurer. Most business at the ASCA Council meeting centered on activities for the 1988-1990 triennium, and the budget needed to fund these activities. After considerable discussion it was decided that a biennial Newsletter would be the prime function for ASCA in the initial years, and other activities would follow from this. From left, seated: M. A. Viswamitra (Vice President), Sydney Hall (President) and Jimpei Harada (Secretary Treasurer). Standing: Krishan Lal, Fang Ming Miao, Wyona Patalinghug, Abdul Hamid Othman, Sadao Hoshino, Peter Colman, Anwar ul Huq, Graeme Gainsford, Richard Gunawardane, Ting-Fong Lai, Phathana Phavanantha, Yu Wang.